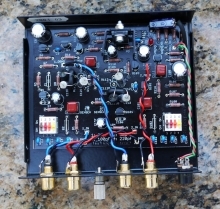 In Vol 6, Hannes Allmaier published his Peter Baxandall - inspired High Octane phono preamp. To facilitate building this preamp, Hannes gives some building tips and lists the Bill of Material. He also graceously provided the Gerber files for manufacturing the PC board for personal/study use. A picture of the populated prototype PCB is here. Please contact Hannes for any commercial use of this project.